Your state can be next. This is one man’s description of how we got the campaign off the ground. I met Linda Evans in 2007, in Oakland, and heard her presentation on an interesting issue that hit close to home: Ban the Box. With the success All of Us or None had in their San Francisco campaign, Linda and her colleagues were trying to share the knowledge far and wide so that all employers in America would judge an applicant for who they are before finding out what they had done. Linda asked me, as a member of Direct Action for Rights & Equality (DARE), when Rhode Island would Ban the Box. In 2009, while at an artist retreat focused on prison issues, I met Sarah Walker, of the Minnesota Second Chance Coalition. They had a pending statewide bill to Ban the Box, which passed their legislature while we were in upstate New York. Sarah never asked me when Rhode Island was going to Ban the Box. She told me we had to do it. Meanwhile, Scott Slater won a special election to succeed his father as the representative from my district in South Providence. He was very quick to explain that he wanted to support civil rights issues and learn about the legislation DARE is advocating regarding jobs, housing, and prisons. In 2010 I took a recently released friend to a legislative committee meeting of RI Coalition of Addiction and Recovery Efforts (RICARES), where I met Ian Knowles. After hearing what they were working on, and wondering how the work fit in with DARE, I asked what their “organizing issue” was- the piece of legislation through which they can do outreach and get people engaged. I asked them how many people in recovery had criminal records. Upon hearing such a high percentage, I asked if they had heard of “Ban the Box.” They had not, so I shared everything Linda, Sarah, and Maurice Emsellem (of National Employment Law Project) had taught me on the issue. After all, our neighbors (Connecticut and Massachusetts) were passing similar legislation. RICARES and DARE began to build a coalition, and I set out to write a bill that took the best of all worlds, particularly the Boston city ordinance on the matter. Rep. Slater agreed to take it on, and we quickly worked to broaden our support. DARE member (and subsequent organizer) Jordan Seaberry branded the campaign with an excellent logo, which turned into a t-shirt. We had a petition, co-sponsors, and got a committee hearing. DARE organized a rally, and I reached out to Republican Mike Chippendale to support the bill. RICARES organized their annual lobby day, while we supported the late Providence City Councilman Miguel Luna’s successful push for a resolution in support of Ban the Box. The key is to tell our stories. John Prince was DARE’s Chairman of the Board of Directors. He served many years in prison, enjoyed massive respect throughout the city, and is courageous enough to share his stories of struggling in the job hunt. Luis Estrada is a formerly incarcerated man, a gifted paralegal, and able to speak with the sincerity of someone who lives constantly under the mark of what he did decades ago. These issues are larger than any efforts of one person or organization. They must transcend, take root, and multiply. I left Rhode Island in August 2011 for New Orleans, but the work at DARE carried on with members and organizers of our Behind the Walls committee. I could do little more than make some calls, send some emails, and write the occasional testimony for the legislature, or the Equal Employment Opportunity Commission (EEOC). DARE and RICARES continued to build support, as did the people of many other allied organizations in the area. The most exciting part of this legislation process, to me, is that directly impacted people are the ones leading the discussion and driving the issue. DARE is an organization that embraces and develops such community members. When I was released from prison, their members’ arms were the only place I felt comfortable. Organizers like Mimi Budnick, Sara Mersha, and John Prince recognized that I could be helpful to my neighbors, and made sure that formerly (and currently) incarcerated people find ways to get involved. We had a bill seemingly come close in 2012, and I tried to be helpful from afar by raising awareness. That year, the EEOC finally developed and passed their own regulations regarding hiring people with a criminal record. This reinforced our resolve and further developed our legal arguments why employers should support this policy and avoid liability. In 2013 DARE and the coalition made a short film, “Beyond the Box,” profiling Donald, Jay, and Thomas, three men who refuse to take “no” for an answer… even if it has been far too common a response, prior to even making an interview. The film even features my first boss out of prison: Frank Jenestreet, owner of Liberty Rentals. When I see him, I basically feel like going to work. This is clearly what everyone in Rhode Island has been doing on this issue: going to work. 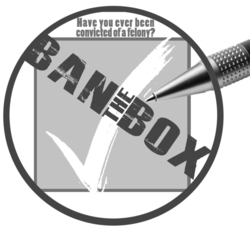 Rhode Island joins Hawaii, California, New Mexico, Colorado, Minnesota, Illinois, Maryland, Connecticut, and Massachusetts- along with over 50 cities and municipalities that have Banned the Box. In fact, half of the states have some form of the legislation enacted inside their borders, as is detailed in a report by NELP. I’m fortunate to have been there in the beginning, but even more blessed that a movement of people are organizing there today. This multi-state, multi-organization support network all relies on people. These are people and organizations who band together to create the Formerly Incarcerated & Convicted People’s Movement, or web platforms like Nation Inside. The support this year was overwhelming, and ultimately so were the House and Senate votes. Governor Lincoln Chafee signed this bill and immediately sent a message of hope to every person in prison, and everyone pounding the pavement looking for work: Keep your head up and keep trying. “Luck favors the prepared man,” so the story goes. It also favors those who can get into an interview and explain who they are, before having to reveal who they may have been on their worst day years ago. This entry was posted in Employment, Legislation, Movement Building, Rehabilitation and tagged Ban the Box, DARE, Direct Action for Rights and Equality, Equal Employment Opportunity Commission, John Prince, Linda Evans, Rhode Island. Bookmark the permalink.